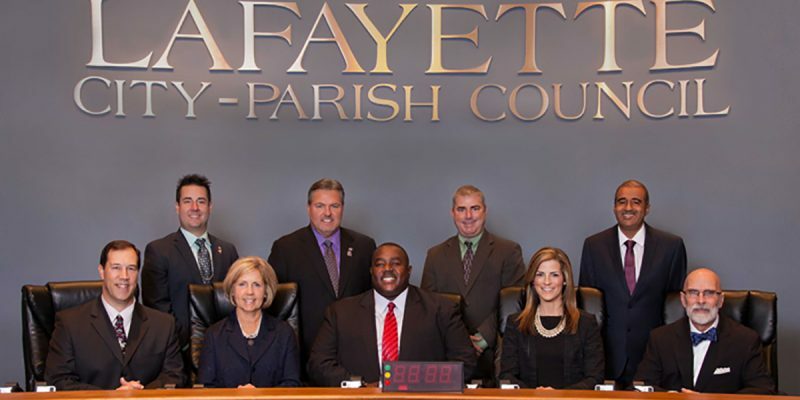 On Tuesday June 6th, the Lafayette City-Parish Council will vote to clear the way for the tax renewals that were voted down in April to re-appear on the ballot on October 14th or November 18th. A 2016 resolution just passed by this very same body would prohibit a tax elections from being held in October. Resolution R-023-2016 limits tax elections to “March and/or the same date as the general election of any given year.” The measure passed 5-3. A day after April 29th’s decisive vote, which squashed three tax proposals for Lafayette Parish, rumors began to swirl about how long it would take before local officials would try to return the same measures to an upcoming ballot. For the April race, some had predicted a low turnout of between 5% – 7% because the election coincided with the area’s largest festival: Festival International. But 25,000 citizens showed up to vote, shocking local politicians who underestimated the strong anti-tax sentiment. President Joel Robideaux, and the rest of Lafayette Parish Government, were obviously counting on the funds. Threats for layoffs began immediately. The Parish Auditor even made an unfortunate comment about bankruptcy, that President Robideaux had to put to bed a few days later. Surely, the City-Parish Council regretted their 2016 resolution ruling out an October election. The irony is rich. So tomorrow, they will take up Kenneth Boudreaux’s resolution R-021-2017. 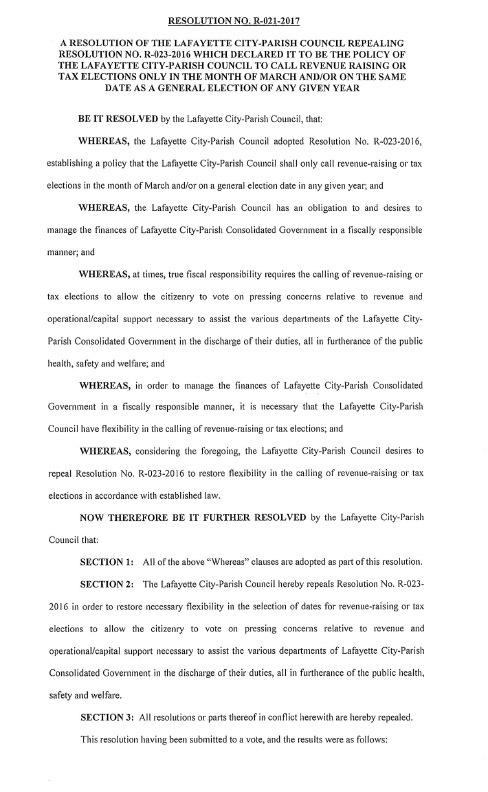 The resolution reads “…the Lafayette City-Parish Council desires to repeal Resolution No. R-023-2016 to restore flexibility in the calling of revenue-raising or tax elections…”. The full text can be read below. Boudreaux’s resolution would mean that the council could call a special tax election any time they felt like it. All they would need to do is add the adjective “emergency” to the proposal. This is a painfully obvious attempt to add both renewals that failed in April onto the Treasurer and PSC race upcoming on October 14th of this year. They could even add it to November 18th, which will serve as a runoff for both races. Politicians are hoping that the possible higher turnout in October could bring less informed voters to the polls. Tax “renewals” are generally supported, especially with higher turnouts. It would be a dirty trick to call a tax a “renewal” when it was just voted down 6 months before. The City-Parish Council knows a new tax is a much harder thing to get past the voters, especially in this current anti-tax environment in Louisiana. No one in Louisiana puts dirty tricks past our politicians. In truth, we expect them. We’ll wait and see if this one works on the good citizens of Lafayette Parish. Previous Article HARTMAN: Welcome To New Orleans, Where You Can Play Real-Life Jeopardy!